Industrial metal detectors designate occurrence of metal in various non-conductive materials such as ceramics & glasses, concrete, fabrics, wood products, powders, plastics and rubber. Industrial metal detectors are used for deciding hygiene or confirming the tramp metal’s non-appearance in wholesale or incessant products, above and over reprocessed materials. The valuable metal manufacturing that comprises metals such as platinum and gold is significantly outsized by means of cost. Substantial demand for such metals in the market stokes demand for effective metal detection equipment. Manufacturers of industrial metal detectors are increasingly emphasizing on the development of cost-effective, strong and accessible products, in a bid to leverage the ongoing requirement for safety screening. Persistence Market Research has recently developed a new report titled “Industrial Metal Detector Market: Global Industry Analysis (2012-2016) and Forecast (2017-2026)”. The report offers an in-depth insights and analysis on the market expansion through the forecast period - 2017 to 2026. The industrial metal detector market has been explored at a global scale, offering information on the market dynamics that are likely to affect the market expansion significantly. The report on global market for industrial metal detector offers an extensive knowledge base to the market players seeking global expansion. Analysis delivered in this report is imperative for the market players & investors for estimating expansion potential of global industrial metal detector market in the near future. Beginning with a chapter on the executive summary, the report delivers future prospects of the segments, coupled with significant market numbers such as the CAGR for historical period (2012-2016) and CAGR for forecast period (2017-2026). Intelligence on profitable regions for growth of global industrial metal detector market is also delivered in the report based on the revenue shares and sales growth rate over the forecast period. A chapter on overview proceeds the executive summary, delivering an incisive market introduction trailed by the definition of “industrial metal detector”, to convey report readers regarding the broad scope of the market. In its subsequent chapters, the report offers information on the latest dynamics including the driving factors, restraining factors, opportunities and trends that might affect expansion of the market. The report also offers segmentation analysis of the global market for industrial metal detector in its following chapters. The global industrial metal detector market is segmented on the basis of product type, end-use industry, capability type, and region. The chapters giving information on the segmentation analysis deliver imperative market numbers with regard to revenue comparison, the market share comparison and Y-o-Y growth comparison. Based on region, the global market for industrial metal detector is segmented into North America, Latin America, Asia-Pacific excluding Japan (APEJ), Europe, Middle East & Africa (MEA), and Japan. The report also offers an intensity map, wherein the occupancy of key players actively partaking in global industrial metal detector market have been tracked. This last chapter of the report delivers information on the market players, providing insights associated with the competitive landscape of the market. Key market players are profiled in detail in this chapter, and information about these market players has been offered based on their key financials, key developments, company overview, product overview, and SWOT analysis. Intelligence offered on the market’s competitive landscape is priceless for readers of the report, as it comprises every necessary insight for analysing contribution of leading players to growth of the market. The competition landscape also enables studying how market players are implementing their strategies and their aims for staying at forefront of the global industrial metal detector market. Industrial metal detectors help in indicating the presence of metallic contaminants in non-conductive materials including ceramics & glasses, concrete, textiles, rubber, oils, and plastics. The industrial metal detectors are employed for determining cleanliness or verifying absence of metal pieces in bulk or continuous products, and recycled materials. Applications of industrial metal detectors include detecting metal chips in pharmaceutical preparations, needles in fabric sheets, and staples or nails in wood. With rapid industrialization, utilization of metal detecting equipment has witnessed a tremendous surge in the packaging industry for inhibiting the coagulation of metal contaminants in pharmaceuticals and food & beverages. Growing emphasis on quality control has compelled packaging manufacturers to use metal detectors at the entrance and exit of production processes so as to detect both non-ferrous and ferrous metals. Metal detectors benefit manufacturers by providing a window of opportunity for investigating the packaging processes. As manual inspection of metal contaminants is reduced, production processes speed up and the labor cost is curtailed. In addition to cost savings, industrial metal detectors protect machine parts against minute metal particles that can result into machine failure and hamper the production process, along with the increase in time delay and maintenance cost. One of the latest trends gaining popularity in the market is the adoption of integrated conveyorised industrial metal detectors. High attention is paid to details of conveyorised system designs for protecting operators during production processes and supporting safe maintenance practices. Details emphasized while designing conveyorised industrial metal detectors include shatter-proof materials deprived of sharp edges, inclusion of safety valve as a standard on all pneumatics, guarded out-feed and in-feed rollers to prevent risk of finger traps. A conveyorised industrial metal detector provides integrated, flexible handling solutions that are capable of working in any environment. Whether the product is packed, loose, frozen, chilled, dry, or wet, an integrated conveyorised industrial metal detector enables manufacturers in resolving any metal contamination apropos to inspection challenge. 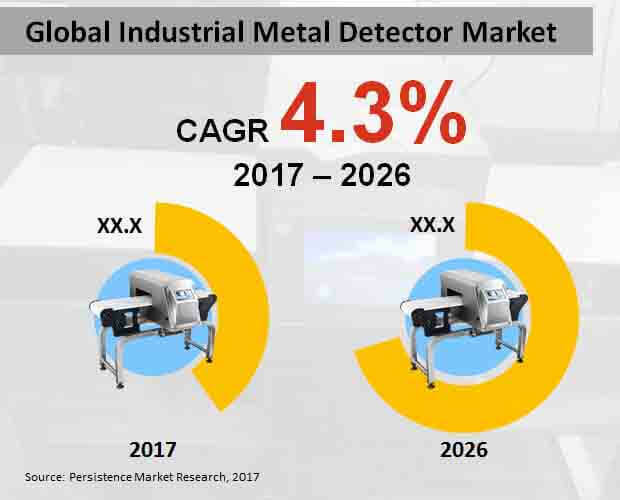 The global industrial metal detector market will exhibit a moderate growth through the forecast period (2017-2026), according to a new report developed by Persistence Market Research. Worldwide sales of industrial metal detector are expected to surpass revenues worth US$ 900 Mn by 2026-end. High demand for packed and processed food products, along with growing demand for medicines to treat diseases such as diabetes and obesity in North America have spurred the production processes in the pharmaceutical and food industry. This has further stoked demand for industrial metal detectors in these industries. North America will continue to be the most lucrative market for industrial metal detectors. The markets in Europe and Asia-Pacific excluding Japan (APEJ) will trail the market in North America, in terms of revenues. In-line/conveyed media metal detectors are projected to remain the fast-selling product in the market. These metal detectors offer flexible and integrated handling solutions and are capable of operating in any working environment. In-line/conveyed media metal detectors enable manufacturers in resolving all challenges related to inspection of metal contamination, despite of the product’s state such as wet, chilled, frozen, dry, packed, or loose. In terms of revenues, in-line/gravity fed - free flowing metal detectors are expected to remain dominant among products in the market. Key market players mapped by the report include Shanghai Shenyi, Cassel Messtechnik, Ketan, COSO, Foremost, VinSyst, Nikka Densok, Fortess Technology, Thermo Fisher, Mesutronic, Nissin Electronics, Sesotec, Antitsu, Loma, CEIA, Mettler- Toledo International Inc., and Eriez.